Over 10 years old ? is a method of calculating the efficiency of central heating [gas boiler, heating, high efficiency] boilers. 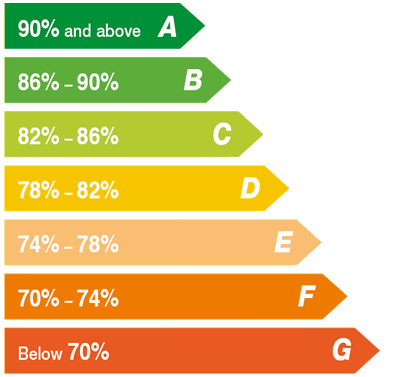 It identifies the efficiency rating of boilers on an A-G scale, which is simple to understand & recognise. Current building regulations stipulate that if you are replacing an old boiler, it should be replaced with one that is A rated. These are 90+% efficient & are all condensing boilers which are more efficient as they extract heat from the flue gases that all boilers produce. Water vapour in the flue condenses into droplets of water, releasing heat as it does. A condensate pipe is installed with the boiler for the condensed liquid to drain away. Non condensing boilers expel the gases directly into the air & this heat is wasted. What are the Different types of boilers ? Contrary to what some people think, if you are replacing an old boiler you do not have to change to a combi, unless you want to. Combination (or combi) boilers are generally considered the UK’s most popular type of boiler, providing central heating & producing hot water on demand, only firing up when you turn on a hot tap. A combi boiler does not store domestic hot water, heating water directly from the mains as required, removing the need for hot water cylinders & water tanks in the loft etc. Hot water is delivered to your taps/shower at mains pressure, providing a shower comparable with a power shower. As well as saving space a combi is generally quicker & easier to install and as such they account for 2 out of 3 new domestic boilers installed in Britain every year. Regular or conventional boilers are used in traditional central heating systems. The boilers work on “heat only” & needs a separate hot water cylinder as well as feeder tanks, commonly located in the loft area. The boiler heats up a quantity of water which is held in the storage cylinder until required. A regular boiler is more efficient than a combi at producing hot water in the first place, but some heat is lost from the hot water cylinder. Regular boilers are a good option for any home where a large volume of stored water is required e.g. in homes with 2 or more bathrooms or where the mains water pressure is low. System boilers work in a similar way to conventional boilers in that they indirectly heat a store of domestic hot water. They differ in that they use an internal expansion vessel & pump, thus avoiding the need for expansion tanks in the roof space. With many of the components built into the boiler itself, these boilers are quicker & easier to install. They are also compatible with solar water heating systems. How do I choose the best boiler for me ? There are a number of factors that need to be considered when replacing your boiler, to decide what will work best for you. A large family using lots of hot water could be better off with a regular boiler. A smaller household using less may be better off with a combi. A combi boiler doesn’t need a hot water cylinder & so needs less space. Where a back boiler is being replaced and space is at a premium, it is often possible, with the variety of flue options available, to remove the hot water cylinder & install the boiler in its place. Whether choosing a combi, regular or system boiler, each delivers all the benefits of high efficiency technology. We can advise you which is best suited to your needs, based on the size of your home & lifestyle and also where the boiler is a replacement, how technology fits in with the existing system. Need more help choosing a boiler ?